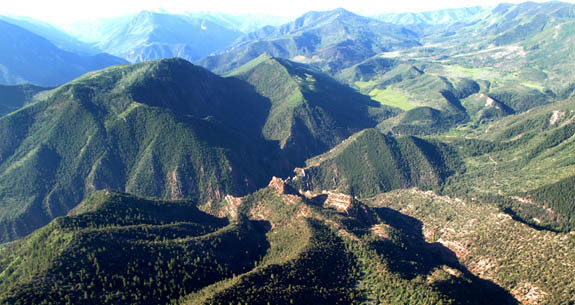 The Thompson Divide was hot-button issue in the CD3 race, with local communities opposed to oil and gas drilling there (photo courtesy of Thompson Divide Coalition). The 3rd Congressional District race that at one point appeared to be increasingly competitive wound up being another blowout win for incumbent Republican Scott Tipton of Cortez, who has promised to bring back coal mining and oil and gas drilling jobs and make Colorado’s Western Slope great again. His Democratic opponent, former state Sen. Gail Schwartz of Crested Butte — a former ski resort and housing planner who championed renewable energy during her eight years in Denver — says her message of revamping the Western Slope economy away from boom-and-bust energy production and toward outdoor recreation, tourism and small-scale manufacturing clearly did not resonate with the same disaffected rural voters who back Donald Trump. The Tipton campaign doesn’t disagree that Schwartz lost the race based on dissatisfaction with the economy, but they say her vision of a “New Energy Economy” was flawed and her lies about Tipton’s record really sealed her fate. “[Democrat] Gail Schwartz lost because she had a bad record standing up for her constituents as a state senator and the voters of the Third [Congressional District] did not buy the lies that she made the cornerstone of her campaign,” Tipton campaign manager Michael Fortney said. Fortney would not address questions about an anti-Hillary Clinton wave or a pro-Donald Trump tsunami, both of which Schwartz said were factors in her more than 14-point defeat to Tipton, who successfully locked in a fourth term in a massive district that includes most of the state’s Western Slope and a southern Colorado area surrounding Pueblo on the Front Range. CD3, which has not been represented by a Democrat since John Salazar was defeated by Tipton in 2010, was considered a Clinton-coattail possibility for Dems as polling at times showed her with double digit leads in the state (she wound up carrying Colorado by more than six points). But both Schwartz and Democrat Morgan Carroll lost decisively in their bids to unseat incumbent Republican men they tried to link to Trump’s attitudes toward women. Mike Coffman defeated Carroll, another former state lawmaker, by 9 percentage points in CD6. “Women across the board did poorly,” Schwartz said of Tuesday’s general election, worrying that the brutal nature of the campaigns – in which Trump made vague threats about shooting Clinton and more explicit threats about having her jailed — may have a chilling effect on more women seeking higher office. Colorado’s congressional delegation (seven representatives and two senators) is just 11 percent female, with one of nine members (Democrat Diana DeGette) a woman. That’s well below the national average of 19.4 percent in both chambers and the overall 51 percent female electorate. Bell says that multiple studies show women are elected and raise money at about the same rate men do, but that there are just fewer female candidates. Despite disparaging comments about women during the campaign and throughout his career, Donald Trump did not lose the female vote by a much greater margin than Republicans in 2008 and 2012, when President Barack Obama claimed the female vote by 13 percentage points his first term and 11 points in his re-election campaign. Clinton exit polling showed her winning the female vote by 12 points. Still, Schwartz says this campaign was especially nasty, accusing the Tipton campaign of lying about her record as a state senator and the impact it had on Western Slope coal mining and oil and gas jobs, while the Tipton campaign blasted Schwartz for claiming the Republican is looking to sell off federally owned public lands in the district. Schwartz argued coal mining jobs in CD3 are being lost to global market forces and the rise in oil and gas fracking, not the clean-energy policies she helped pass that are more popular on the Front Range than the Western Slope. But in a statement Wednesday, Tipton again rejected that notion. “Travelling throughout the district, constituents constantly tell me that they are not feeling the economic recovery they keep hearing about,” Tipton said. “In our state we have a tale of two economies. Denver and our resort communities are doing well, but our western, rural and southern communities have not benefited from this growth. But Schwartz said a return to old-energy policies under Tipton and Trump won’t do the trick. Schwartz said she’s now very worried that the EPA’s Clean Power Plan will be killed by Trump and that all the progress Obama made on climate change will be rolled back. That will adversely impact the natural beauty of CD3 and possibly mark the beginning of the end for the state’s ski industry, she added. She accuses Tipton of selling out to energy interests. But Schwartz concedes Democrats underestimated the rural and Rust Belt economic frustration on the Western Slope and nationally. Schwartz, a Crested Butte resident, ruled out taking on Tipton again in the next election cycle, which she warns could be a Democratic wave if Trump triggers a recession and overreaches on issues like climate, immigration and health care. She said she’s moving on to pursue other opportunities. Democrats have now lost CD3 by 20, 12 and 14 points the last three election cycles, pointing to its solid stronghold status for Republicans for years to come.